Today's Daily Telegraph has an article by David Middleton on first grade players from NSW and Queensland who have been killed in battle. Seven North Sydney players are mentioned - the text of their entries is below. I've also included links to the details for each on the Roll of Honour on the Australian War Memorial website. As they say, Lest We Forget. Vince Edwards: Edwards appeared for North Sydney in the year of the club's last premiership win in 1922 and three years later joined the Navy. He died at sea on March 1, 1942 when HMAS Perth was torpedoed by the Japanese off the coast of Java. Artie Carnell: Carnell played fullback for North Sydney at age 21 in 1930. A decade later he was posted to 2/14 Infantry Battalion in New Guinea. He was killed in action at the Battle for Milne Bay on August 31, 1942. Harry Allwork: An English-born forward, Allwork played 16 top-grade games for North Sydney in 1933-34 before enlisting in the army in 1940. He was killed in action at El Alamein, Egypt, on October 31, 1942. Ken Wood: Wood was a centre for North Sydney between 1928-34. He enlisted in the Army in Brisbane in 1940 and was a sergeant with the 2/25 Australian Infantry Battalion when killed in heavy fighting at Gorari in New Guinea on November 11, 1942. Alf Birtles: Birtles had played 50 first-grade games as a winger for North Sydney between 1933-37 before he enlisted with the RAAF in 1941. A Flying Officer aboard a Halifax bomber, he was killed in a battle over Germany on August 28, 1943. Gerry Atwell: Atwell played for Norths in 1940, a year before he joined the RAAF. By 1944 he was a pilot officer with the 614 Squadron RAF and was killed in an air battle near Italy on April 20, 1944. Neville Butler: A NSW fullback in 1938, Tenterfield-born Butler played for Norths between 1940-43 while he was training with the RAAF in Sydney. He was flying officer with the 460 Squadron and was killed on November 29, 1944, when his plane was shot down over Germany. thanks for that Fintan..is there any details of service men from Norths in the later conflicts..Korea, Vietnam.. Presumably the others were grade players, club officials, members of the football club generally. Neville Butler played in the 43 GF..
Not aware of one, the 1960's Annual Reports would have mentioned the Korean Campaign deaths if they had occurred. Statistically considering the numbers serving/dying in WWI and WWII compared to later conflicts, there'd be few RL grade players lot alone first graders across any club. The other 4 diggers named in the 1967 Annual Report have surnames too common to pin down with a first initial only [Armstrong, Griffin, Morrison & O'Sullivan]. I found this site from the National Archives of Australia - "Mapping Our Anzacs" at http://mappingouranzacs.naa.gov.au. It has names, details, photos and service records of the original Anzacs. It's described as "a tool to browse 375,971 records of service in the Australian Army during World War I according to the person�s place of birth or enlistment." With Anzac Day fast approaching, perhaps time to resurrect this thread. Lest We Forget these great people. I went to a performance this evening that was set against the backdrop of World War I, conscription and rugby league. Players that got mentioned were from mainly from the Glebe club, including Frank Burge who later coached North Sydney. Another link with the NS district was Ted Larkin who was a Rugby League administrator and who, in December 1913, won the state seat of Willougby in the NSW parliament, the first time Labor had won a seat in the northern suburbs. Larkin was living in Milsons Point at the time. The reason he got mentioned is because he was one of only three serving politicians who served in the war. He had enlisted in August 1914 and was killed at Gallipoli on 25th December 1915. The performance starts with a reference to Bob Tidyman who played for Eastern Suburbs and was killed in France in November 1916. The performance is by the Griffin Ensemble - its leader, Michael Sollis, used to play for the Gungahlin Bulls in the local Canberra comp. The performance is interspersed with video footage from WWI era as well as interviews with current Gungahlin Bulls players, some of whom would have been the same age as some of the soldiers at Gallipoli. One thing I learnt was that the back of the Bulls jersey has the logo of North Canberra Bears on the back, above the number. The SMH published a preview report (reprinted from the Canberra Times) on 15th April - www.smh.com.au/entertainment/music/griffyn-ensembles-the-dirty-red-digger-looks-at-war-and-rugby-20150415-1mjr68.html. Conscription, class war, and Rugby League. Live music, archival footage, and documentary film combine in The Dirty Red Digger: The story of World War I in Australia through events in Rugby League between 1914 and 1918. From the working class tenements in 'Dirty Red' Glebe, the divisive Prime Minister Billy Hughes, and the traitor/hero status of boxer Les Darcy, this special multimedia event explores the battle for Australian identity and the Anzac legacy. Comparing the stories of young men in the trenches with young men today, this is a special event not to be missed. The Dirty Red Digger is a groundbreaking collaboration that sees Rugby League communities collaborate with art music, exploring the struggle for Australian identity during World War 1, and the challenges of young men today and a hundred years ago. The program features music that we know was played during WW1 in Australia, and Australian music that has been written since. With over 40 minutes of archival footage and a series of interviews with young men and women, this will be premiered in Canberra and then tour nationally. The NRL website has a short article on Ken Wood who played 1st grade for North Sydney from 1928-34 (68 games 15 tries 45 pts). He enlisted in the army in 1940 when he was living in Brisbane. The NRL article has an accompanying video but it didn't work on either of the browsers I tried. Sunday's game at NSO was preceded with an Anzac commemoration, and the names of a number of North Sydney players were read out, including Ken Wood. Kenneth Wood was born in Petersham, Sydney in 1906. He began his first grade career with North Sydney in 1928 and finished with Norths in 1934. He played seven years with 'The Shoremen' (as they were known before adopting the Bears nickname), scoring 15 tries in 68 games as a centre-three-quarter. 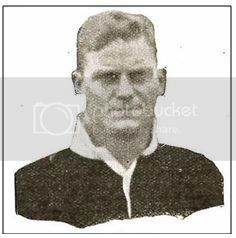 Wood played representative football for Metropolis against New Zealand in 1930 and was selected to play in the NSW tour of QLD, however did not appear in the interstate clash. He enlisted in the Army in mid-1940 when he was living at Gregory Terrace, Brisbane working as an auctioneer's clerk. After army training he embarked in early 1941 for the Middle East with 2/25th Battalion and served for eight months there. During this time he was promoted to Sergeant, before being returned to Australia. Wood returned home for just 10 days before heading off to New Guinea to face the Japanese. In September, the 2/25th was thrown headfirst into the battles on the Kokoda Track, and participated in the withdrawal to Imita Ridge before the Australians then turned the tables and began to push the Japanese back at Templeton's Crossing in October and then Gorari. On the final day of that fierce battle, November 11 – Remembrance Day, Ken Wood was killed in action. He is buried at the Bomana war cemetery in Port Moresby.